Team Wairoa have made it through the rain, wind, sweat and sickness, to get to the finish line and onto breakfast for 2014. 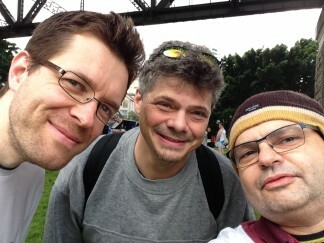 Dave, Alex and Anthony have completed the Harbour Bridge run. 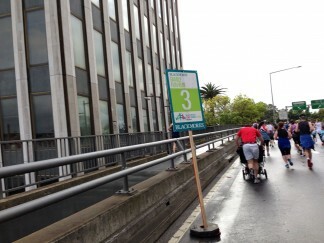 Dave did the 9km run in 1hr 15min, and Alex and Anthony the 3.5km run in 22:54 min. It was a drizzly start to the morning but at least it was cool and not windy. Alex and Anthony set at 7.50am and Dave at 9am. We all met back at City Extra to recover as the day warmed up. Anthony had a sore throat at the beginning of the week. Not again! However, antibiotics early on did the trick. Taking no chances, and having to travel light, out came the beanie. He ran with skins to keep him warm. It’s not the run that’s the issue in keeping warm it’s when you stop running and you cool down at the other end that’s when you can leave yourself open for problems. He has been there! Alex had no problems. The morning rain left a slippery surface especially on the white pained line markers which some runners slipped on. It is a spectacular city we live in. 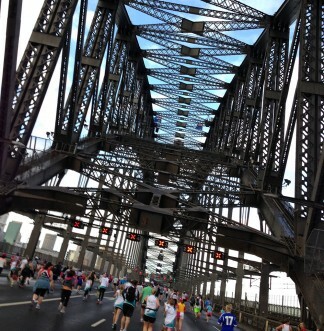 We have the opportunity to run on the Bridge, along the Cahill Expressway to see the amazing harbour and the Opera House and end up in the beautiful Botanical Gardens. We arrived at the recovery village early before the other groups came through. Bliss – no lining up for all the free stuff. Always being dentally careful what we have. We watched the marathon runners on the large screen. Amazing at the pace they keep up constantly. Anyway, we moved onto warmer areas like City Extra and sat in a booth waiting for Dave to come through. He skipped the recovery village’s crowds and came straight to city extra for the big breakfast! Yes, it had everything that contained fats and cholesterol and protein! Thanks to everyone who supported us this year. It was fun running for Wairoa special school. All donations will go to Wairoa School Gift Fund and are tax deductible. The donations are allocated specifically to resources and programs that benefit the students.